Superstition can be an impressive plot motivator, and when tied to a ghost story, even better. 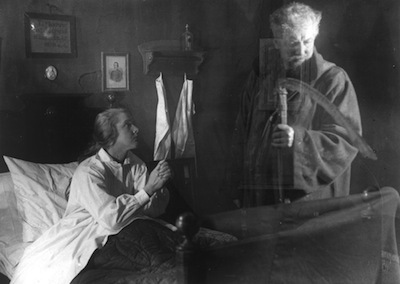 Victor Sjöström's 1921 silent film The Phantom Carriage is a spooky morality play. A campfire parable that is to the Swedish chill what Dickens' A Christmas Carol was to English winters or It's a Wonderful Life [review] to the American can-do spirit in difficult times. Sjöström is best known for playing the professor obsessed with his own mortality in Ingmar Bergman's seminal 1957 film Wild Strawberries, and this picture--which he wrote, directed, and starred in--makes Bergman's casting choice all the more brilliant. Beyond the influence of Sjöström's work on his own, Bergman gave the veteran filmmaker a chance to sew up the thematic threads begun in his own cinematic efforts. The Phantom Carriage is set on New Year's Eve. As a good-hearted nurse in the Salvation Army, Sister Edit (Astrid Holm), nears death from pneumonia, she asks to see David Holm (Sjöström) so that she may make one last attempt to save his soul. As Edit's friends and colleagues reluctantly look for him, David is drinking in a graveyard with a couple of other degenerates. 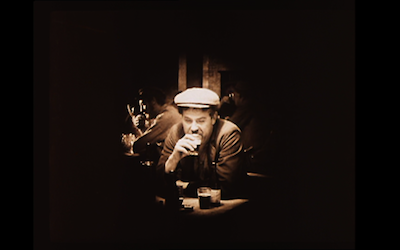 He tells them the story of his pal Georges (Tore Svennberg), a fellow boozer who cleans up his act every December 31st because he's afraid to die before the New Year is rung in. Georges believes that the last person to die before midnight is cursed to drive Death's spectral caravan for the next twelve months. Unsurprisingly, Georges has been missing since the previous turn of the calendar. Wherever could he be? Mwuahhaha! When David is finally found, he refuses to visit Edit. Afraid that this act of human callousness can never be undone, his drinking buddies try to force him to go. Their fight ends up with David dead, and the Phantom Carriage comes to pick him up just as the clock hits 12:00. Georges and David are surprised to be reunited in this way, and before Georges can step down and give David the reins to the chariot of Hell, he decides to take him on a tour of his previous wrongdoing so that he might clear his soul of its excess baggage. Through a series of flashbacks and visitations, we learn David's twisted history, including his year-long torment of Edit, who never gave up on him, the first ward of her charitable outpost. Injury to insult, David is the one that infected Edit in the first place. He also tormented his wife (Hilda Borgström) to the point where she is not sure she can carry on with living. In one particularly effective scene, Mrs. Holm tries to lock her husband in the pantry, only to have him break through the door with an axe. Fans of Kubrick's The Shining will quickly see that Ingmar Bergman was not the only one inspired by The Phantom Carriage. Sjöström, who based his script on a novel by Selma Lagerlöf, has put together an effective, oftentimes unnerving silent horror film. Though there is a moral to David's night of terror, it is not necessarily governed by any particular morality. Sure, Christianity is often evoked, but it's more or less just window dressing for the larger supernatural narrative. David is a bad, bad man no matter what code of ethics you subscribe to, and his horrible fate is more of a human punishment than a divine one. The tour that Georges takes him on is not necessary, he could just take off the grim reaper costumer and be done with it, but he wants his cohort to understand both the awfulness that awaits him and also his own role within that never-ending, gruesome cycle. The Phantom Carriage is staged on realistic sets, with Sjöström emphasizing the impoverished conditions and how the difficulties of this kind of life can lead to unwise solutions and easy escapes. This is expertly contrasted with the more fantastical elements of Lagerlöf's tale. Sjöström creates a dark, gothic landscape where mists and shadows can believably disperse to reveal unbelievable creatures. Particularly inspired is a short tour of a night's work riding alongside Georges, as he gathers the spirit of a man who shot himself and another who drowned. 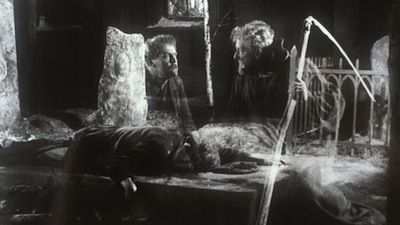 Sjöström and cinematographer Julius Jaenzon use double-exposure photography to imprint a translucent ghostly stagecoach over the scenes. Georges takes the Phantom Carriage across the water...and then under it. It's an impressive use of early photographic techniques. But then, we've also seen those kinds of special effects employed elsewhere, and as with any era's innovations, they don't stand the test of time on technical skill alone. There has to be some human element to create a lasting appeal. For the many hats he wears, and as anyone who has previously seen Wild Strawberries already knows, Victor Sjöström is best in front of the camera. He is a tremendous actor, one who is capable of astonishing cinematic emotion. His performance lends an authenticity to David's rollercoaster life: from temptation to reconciliation, disappointment to malice, and then ending at a point of true redemption. Sjöström sells each with equal vitality. Though, I must admit, the most surprising was what a fearsome villain he makes in The Phantom Carriage. It makes me curious to find out if he ever played a bad guy again. 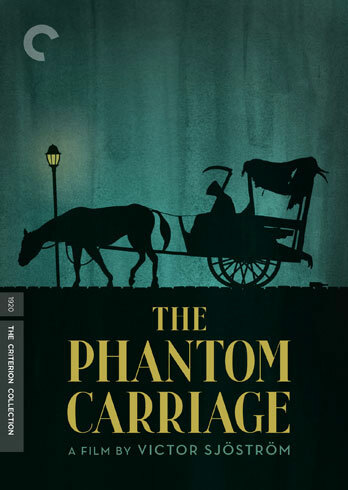 Though set on New Year's Eve, Criterion's The Phantom Carriage is smartly timed to arrive just in time for Halloween. I would happily place it with other Halloween classics, such as the Bela Lugosi Dracula or Robert Wise's The Haunting , or this year alongside the forthcoming home release of Kuroneko [review], as part of my holiday viewing. It's also one you could put on the TV and play as background at a Halloween party, if that's your thing. Of course, only after you've screened it yourself, alone in a darkened room, just you, Death's emissary...and your soul.